On October 5, 1957, a Soviet ICBM carried the world’s first man-made satellite into earth orbit. It was a stunning technological feat and a peerless propaganda coup. The 184-pound sphere named Sputnik (“traveling companion”) ushered in the Space Age. Two months later, the United States’ first attempt to launch a satellite ended ignominiously when a Vanguard rocket blew up on the pad. The world press dubbed it “Flopnik” and “Kaputnik.” But in January 1958, America became the second space-faring nation when a Juno rocket placed Explorer I in orbit. And in the years that followed, vision, skill and determination increased both our confidence and competence in this new environment. The early frustrations with Pioneer, Ranger, and Centaur were overcome. Manned spaceflight reached a dramatic peak with a dozen astronauts prowling the bleak surface of the moon. Unmanned probes were at their most splendid transmitting photographs of Saturn’s rings and Mars’ rocky red plains. And we look back from the silver anniversary of spaceflight with a remarkable new vehicle emerging from its test program with impressive credentials. Or do we look back? Nearly half of us are too young to remember a time when there was no such thing as an artificial satellite. Nearly a fourth of us came to consciousness with Armstrong and Aldrin’s walk on the Sea of Tranquility part of history, as remote as the voyages of Magellan. Even the memories made of steel and concrete are slipping away. The flights of John Glenn and fellow Mercury astronauts Scott Carpenter, Wally Schirra, and Gordon Cooper started from Complex 14 on Cape Canaveral. Here Glenn sat for four-and-a-half hours in his capsule atop an Atlas rocket, until with 13 minutes left in the count the launch was scrubbed. Finally, on Feb, 20, 1962, after four more postponements, Glenn was hurled skyward for the three-orbit flight which made him a national hero. The last manned flight from Complex 14 was Cooper’s 24-hour marathon in 1963. In later years, the pad was used to launch the Agena target vehicles used for rendezvous and docking practice during Gemini. At the entrance to the complex on ICBM Road, there’s a monument to the seven Mercury astronauts, a time capsule, and a plaque honoring “the thousands of men and women of the free world who contributed.” The plaque is green-black with corrosion, and a family of mud wasps has taken up residence on the gleaming monument—changes easily reversed by the next round of maintenance. But inside the complex’s perimeter fence, more permanent changes have taken place. The gantry had begun rusting so badly that spaceport employees would come out after storms to see what had fallen off. It was dynamited in 1976, and pieces of it still lie where it was destroyed. The pad is a junkpile of broken concrete being overtaken by weeds and vines. Foundations for long-gone structures and equipment create an obstacle course. The blockhouse, stripped to a shell, is a storehouse for Mercury program records. Walls still standing bear the legend ABANDON IN PLACE stenciled in black. Similar fates befell other historic sites. Complex 19 was the point of origin for 10 two-man Gemini-Titan launches. 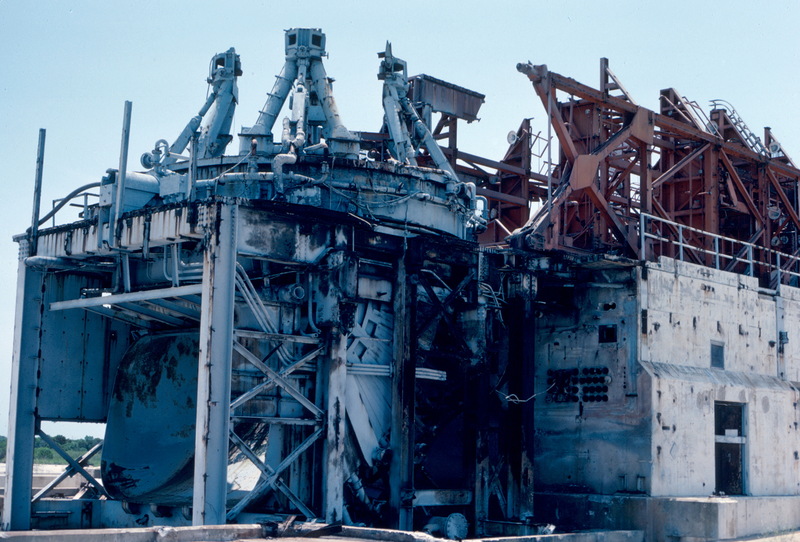 The unusual Titan gantry, which was hinged at the bottom and rotated 90 degrees before launch, lies in the horizontal position with birds nesting in its deteriorating remains. Poisonous snakes infest the surrounding area. Further up the coast lies Complex 34, once a launch site for the powerful Saturn I, and the spot where three astronauts died in the Apollo 1 ground test fire. Little remains of the complex, which was used for only one manned flight—Apollo 7. The flame trench is outlined by scorched firebrick, a former building by crumbling linoleum. The service tunnel beneath the pad is knee-deep in water, while the green and white oxygen tank is streaked with rust. The past has not been completely abandoned, of course. Complex 5/6, from which Alan Shepard and Gus Grissom were lofted on suborbital flights, is part of the modest Air Force Space Museum. A boiler-plate Redstone sits on the pad, and the blockhouse contains many of the original consoles. And efforts are underway to interest the Department of the Interior in preserving Complex 13, an Atlas pad similar to its neighbor 14. But for the most part, the drama of America in space plays on only in the memories of those who starred in or witnessed it, and is preserved only on cold film and video. The stages on which the curtain rose stand bare, somber, and silent under the Florida sun, victims of the very progress they made possible. 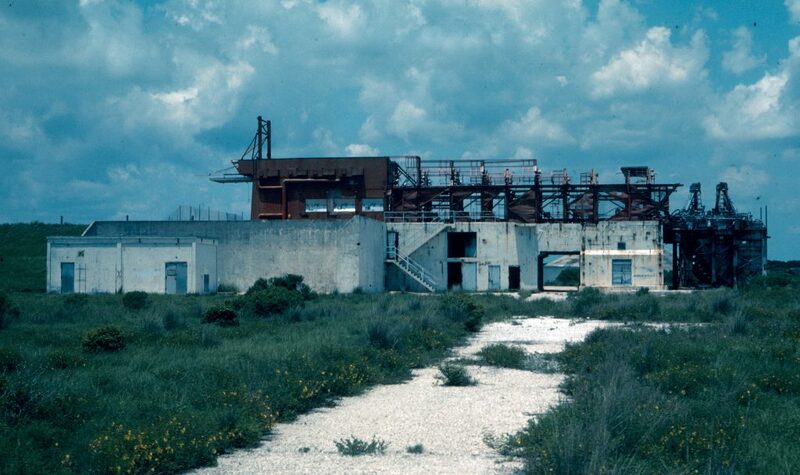 Update: Launch Complex 13 and the remains of Complexes 14 and 19 were added to the National Register of Historic Places in 1984. Complex 14 has been cleaned up, and a new monument added at the base of the ramp to the launch stand. The Complex 14 blockhouse was renovated and reopened in 1988 as a conference center.